–FREE 90 minute Harbor Tour from the Port of Oakland in September and October RSVP by Monday, September 7th at 10 a.m. sharp or you will miss the boat! ***Please note: There is a maximum of 130 people per tour. -Bank of America Free Museum Weekend is this weekend! Participating Bay Area Museums are offering free admission to six Bay Area Museums and two Sacramento museums. You must show your Bank of America or Merrill Lynch credit or debit card for free admission. -This Saturday, September 5th only is the California Department of Fish & Game’s Free Fishing Day. You can fish without a sport fishing license! Labor Day weekend is one of the best weekends of the year to shop, if you’re looking to save a sizable chuck of change. There are tons of end-of-season sales and markdowns for the occasion — 20%, 30%, 40%, upwards of 70% off on some sites. Below, we’ve assembled a cheat sheet of over 30 sales not to miss. Visit Amazon’s Labor Day section to browse all of the deals happening over the holiday weekend. The majority of these discount opportunities are time-sensitive, so check the ending time and date on each product to see how long the sale price will last. Best Buy’s four-day sale has loads of deals on HDTVs, laptops, tablets, and more. The Big Brown Bag Sale is back again this September. You can save 20% to 70% on shoes, watches, clothing, and more — and take an extra 20% off select sale and clearance items using the promo code BIG20 at checkout. Take 40% off your purchase, in stores and online, through September 8 using the promo code BRFALL. You’ll also be able to shop a select number of online-only items for 50% off. Shop dress shirts, suits, ties, and more for up to 70% off during Brooks Brothers’ Labor Day final clearance event. Gap’s Labor Day event will save you a cool 40% on everything, in stores and online. Online only: You can shop 30% off your order of $125 or more by applying the code GETSHOPPING at checkout. The offer is valid through Wednesday, September 9. Get 30% off your purchase of $150 or more with the promo code LDWSALE. The offer is valid in stores and online through Monday. Save 10% on your entire order through Monday, September 7. Simply enter the promo code LABORDAY at checkout. There are a lot of ways to save at Macy’s this weekend, but the department store is placing an especially strong emphasis on its Super Saturday Sale. Save $50 on a Microsoft Band, $100 on select PCs with the code SAVE100, up to 30% on other select PCs, and more at the Microsoft store this Labor Day. There’s a lot happening here. Take up to 40% off select men’s, women’s, and kids styles through September 13. Nordstrom’s end-of-summer clearance sale conveniently coincide with the long holiday weekend. Save 10% on order totals of $100 or more, 15% on order totals of $250 or more, 20% on order totals of $500 or more and 25% on order totals of $1000 or more.Enter the promo code SAVEMORE at checkout. Now until September 9, you can take an additional 50% off already-reduced styles at the brand’s end-of-summer event. Save 10% on everything, including sale items, at the popular home store through Monday, Septemeber 7. Use the promo Code EXTRA10 to redeem the offer. 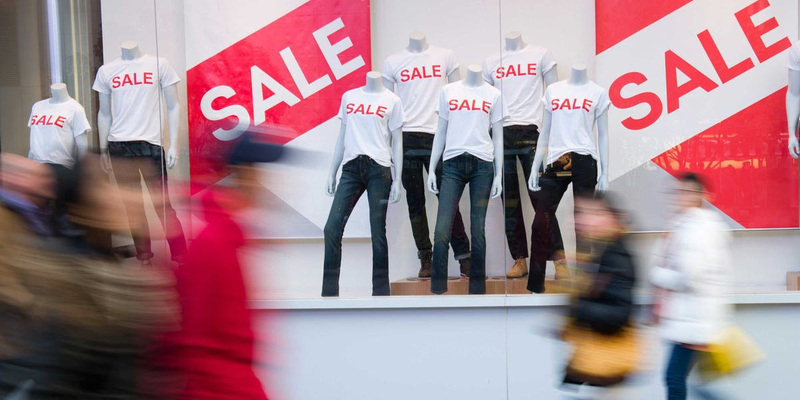 The retailer is slashing prices by 25% on select clothes, shoes and accessories. Plus, select home items are up to 25% off. The Labor Day specials range from clothes and accessories to bedding, kitchen appliances, and them some. You can check it all out here. Pottery Barn’s cousin home goods store, West Elm, is hosting a big sale this weekend, too: You can save 10% on order totals of $100 or more, 15% on order totals of $250 or more, 20% on order totals of $500 or moreand 25% on order totals of $1000 or more.Simply use the promo code SAVEMORE at checkout. Save on hundreds of cookware, cutlery, electronics, and more: The kitchen-supply store is taking up to 60% off outdoor essentials, 20% off its in-house cookware, and $150 off a Vitamix blender, among other things. Explore your favorite places in the world for less! WHY WE STOPPED WATCHING THE GRAND OLD GAME OF BASEBALL – at least in San Francisco – or, root for the good guys, as available, as you / we see it! Save Hundreds in this Fantastic Offer (BBB A+ rated) – You pay only $12 processing fee plus applicable taxes at resort location you choose. YOUPON – GROUPON !Advertise on… No Fees!